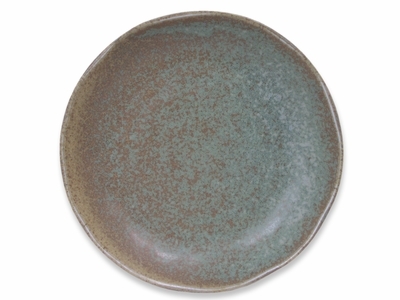 Made from durable ceramic, this small Japanese plate is perfect for nature-lovers and those who want to add an earthy look to their tableware. With a scalloped rim and a smooth papery texture, this handmade appetizer plate is a wonderful choice to hold small saucy dishes as well as appetizers such as Japanese salads, pot stickers, bread, or any dressed appetizers. Painted with a pale forest green mixed with a brown sandy color, the plate is reminiscent of Spanish moss. With subtle grooves in its center, the Japanese plate brings ripples in the water to mind. Because this wonderful plate is handmade in Japan, each plate that is made is different from the next, adding a component of uniqueness to every plate. For those who are in touch with nature or simply love earthen style, this Japanese plate along with any other products in the Moss Green collection will give you exactly what you desire. Microwave and dishwasher safe, this small piece of nature is a useful and charming addition to your dining table.